The last-known genuine MG works rally car is being offered for auction, 35 years after its competitive farewell. 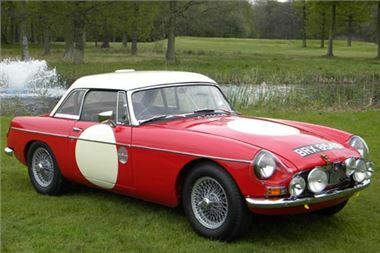 It is expected to fetch bids in the region of £90,000 - £130,000 - over 100 times greater than the price of the road-going MGB in 1964 - at the Historics at Brooklands auction on the evening of June 2. One of two MGB rally cars built in 1964 - at a time when the road car was priced at £850 - the ‘Comp Shop’ car offered by Historics made its racing debut in the Spa-Sofia-Liege rally in August 1964. It went on to compete a further five times as a works entry, at the Tulip Rally, The Acropolis Rally, Geneva Rally, the Castrol Danube Rally and the RAC Rally, all in 1965. Consigned to the garage in 1975, Registration BRX 854B has since undergone a meticulous restoration - overseen by MG historian John Baggott and legendary MG racer Barry Sidery-Smith – before rightfully returning to the public gaze at the Le Mans Classic in 2008. The car is attributed the correct HTP (Historical Technical Passport), meaning it is also eligible for other such prestigious events, including the Goodwood Revival, Monaco Classic Grand Prix and other pre-65 races, upon invitation. Plucked from obscurity, the current vendor has completed the sympathetic restoration with meticulous attention to detail, painstakingly restoring and replacing existing parts or on occasion sourcing period parts with no expense spared. Lot 48 is offered for sale complete with documentation – including letters from the British Motor Industry Heritage Trust and the BMC Competitions Department – original handbooks, racing instructions, receipts, restoration archive photographs, magazine articles and newspaper clippings from 1964 and 1965. For more information, and to attend the Historics at Brooklands auction on the evening of June 2, call 0800 988 3838, e-mail: auctions@historics.co.uk, or see the website, www.historics.co.uk. Entry by catalogue only, available prior to, or on the evening. Previews on May 31 and June 1.